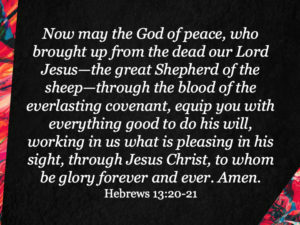 The letter to the Hebrews concludes with a prayer of benediction for us as followers of Jesus (Hebrews 13:20-21). In its original setting it was especially appropriate for the church as it prepared for persecution and suffering. For us today, the prayer is necessary as we look to Jesus by faith in the challenges of our day. God provided everything we need for salvation in Jesus Christ and provides all we need to live for His glory. Prayer is the way for us to lay hold of His promises. Prayer acknowledges that we’re needy and that God is faithful to provide. When He does provide, He gets the glory because we know that He did it.